OUND STRANGE? This is the reverse of what we always think about confession. It is positive psychology applied to sinning souls. Now, I’ll be the first to recognize that positive reinforcement can be a good way to encourage people to do good. 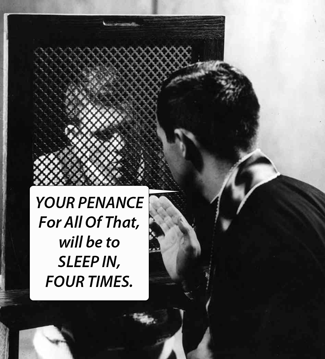 But the Catholic idea of confession departs to a very different point of view. This point of view, at the root of the Faith, is that we are sinners because of Original Sin and we need to confess our sins to obtain forgiveness. Seriously, why do we always have to pretend we are good? We try, many times, but the weakness of our nature is there. Must we pretend we are like angels? (I have not met any in my lifetime.) Applying this attitude to confession, would be like going to a doctor and getting welcomed like this: “So, tell me how well your liver has been working in the past month? I know you have a wonderful stomach!” (when it is all true, but on the other hand you are displaying symptoms of a heart attack that he is ignoring.) Please, give us the freedom to be sinners! There are others that are more interested in your sins as a citizen: “Have you paid taxes? Are you going to vote? Did you respect street signals?” Not voting is a sin? Yes! Maybe. Okay, maybe I’m wrong. But while I’m here I want also to propose some new sins that we should confess in this new time of technological progress. I think it is a big sin when you are chatting on Facebook and someone shows you the sign for OKAY (the famous finger that the developers of Facebook introduced not long ago) even if you are telling them you are going to die during the night. Other sins are from the people of Google: have you ever tried a Google search of your name and found that for some mysterious reason your name is also featured in unmentionable websites, making you afraid that you may have done something wrong without having memory of it? Last, but not least: what do you think of those people putting “lol” everywhere: “Yes, I am going to raise your salary, lol”; “Of course, your nodule is benign lol”; “You know I will never betray you, lol.” How many Hail Marys would this kind of sin deserve?